Q: You left Dortmund and decided to go back to Spain to join Real Betis. What was the reason behind it? A: I wanted to get more minutes, to play more consistently and that’s why I left. I also wanted to have a bigger chance of going to the World Cup. Here, I’m motivated to do well with Betis. A: I think both teams are really good and have really good players and that’s why you are going to see one of the best games in the La Liga this season. Q: Would you say you’re in the best form of your career right now and how did you get to this stage? A: Yes I think training Betis has been going well and because of that, I’m in the best form, both mentally and physically. 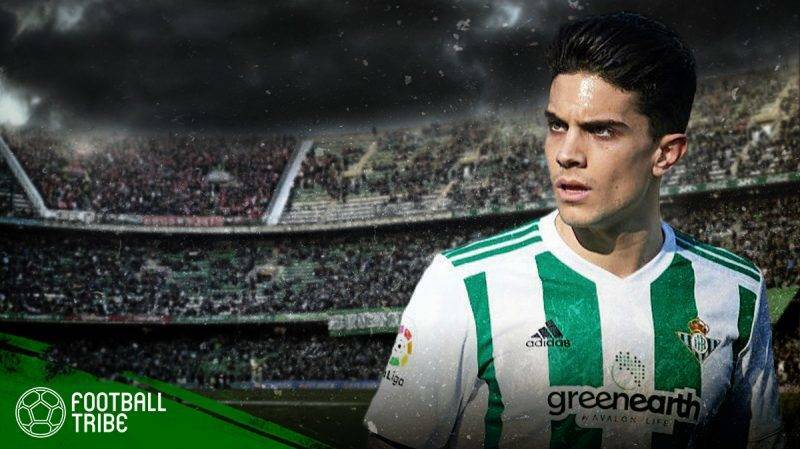 Q: You’ll be playing in your first Andalucian derby – how different do you think this will be from the Catalonia derby between Barcelona and Espanyol? A: Both derbies are very intense, but right now there’s so much of focus on Andalucia. The intensity here is great and both teams are also competing for a spot in Europe at the moment. That adds pressure into the derby, you know. Q: This derby match seems like one of the most important ones in La Liga. What makes a derby match very special? A: A derby game is special because it’s a match you don’t only play using your head and legs, but you also use your heart. A simple action on the pitch can make thousands of people happy, and that’s really incredible. That’s why these derby games are important. Q: All your life, you’ve primarily played in a back four. But in Betis, you are being used in a back-three system. How do you feel about playing in that system and has it made you a better player? A: I’m happy to play in both systems and I’m comfortable in playing with a back three as well. The most important thing is what you do with the ball and the philosophy of the team on the field. It doesn’t matter if it’s a back-three or a back-four. Q: Marc, your time in Germany was very good in the beginning, but after the bus attack incident, things became very difficult for you and you had a bit of problem on the pitch. What did you learn about football from your time in Germany? A: I disagree. I think I was playing well as a center-back for the team under Thomas Tuchel and later on Peter Bosz. We won a lot of matches and things looked very positive. I feel things changed in November when there was a change in team dynamics. Peter Stoger was playing me in a different position and he was very direct with me about my playing chances. So I decided to not waste time because I wanted more minutes on the pitch and that’s why I moved back to Spain. My time in Germany was very good. We managed to win one trophy and I had a great relationship with the fans. And I definitely learned a lot about the league. Q: In your opinion, what has been the best La Liga match of the season this year? A: I think it’s the match between us(Real Betis) and Real Madrid at home. We played really well in the first half and had a 2-1 lead. But they came back in the second half and played good so they won the game. It was a very difficult game, but it was a great match for everyone. Q: What do you think of Morocco’s qualification to the World Cup and what are your expectations for the match against them? A: I think Morocco did a fantastic job to qualify for the World Cup, they played really well and they have a good team. So I think they can do well in the World Cup this year. Q: Do you have any special preparation for this derby and what is the meaning of this derby for you? A: I think preparations wise, it will be the same as every other league game. We will work as hard as possible for it. All my life, I have only seen this derby and experienced the rivalry from the outside. Now it will be nice to experience it from the inside. Q: What do you think about the MLS and will you be interested in coming to play here someday? A: I like the MLS and I have a lot of friends there. I think it is getting better and the game is improving. The league is a good league, which is positive for football. Maybe someday in future, I will go there. But I’m still 27, so not now. But you never know. Maybe someday. Q: What are your hopes for the World Cup and do you think you will be playing in Russia? A: I definitely want to. I’m excited about the World Cup and that’s why I need to work as hard as I can with Betis in La Liga at the moment. Q: How are you finding life in Seville and were you expecting things to go so well? A: I’m very happy in Seville. For many people, Sevilla is one of the best cities in Spain. Usually, it takes time to adapt, but I have adapted very well here and I’m close to everyone in the team too. It feels like I have been here for many years now and that’s a good thing. I’m very happy here. Q: Sevilla have had a rough season, they just changed their coach for the second time. Do you think this puts Betis in a position of advantage or do you think Sevilla will be more motivated to come out and get a win? A: As I said, I think you will be watching one of the best games in La Liga this year. Sevilla is a very good team, and they have really good players. So that will make them a difficult opponent to face. It will be very intense, for sure. Q: How is like playing under Quiqua Setien at Betis and how is he different from other managers? A: I think he is a very good coach and he has done a good job. Our training sessions are very strategic, he tells us what to do with the ball and without the ball. It’s very detailed and this is very important for all the players’ confidence. He is also very experienced, he was once a player, and now a very good coach too.